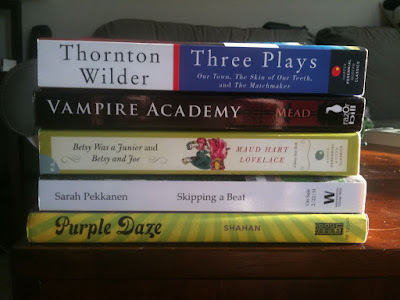 My Readathon Pile – my books. my life. It’s Readathon time again! Dewey’s 24-Hour Readathon is this Saturday at 8am EST. Who’ s in? And today is my obligatory post showing you my Readathon Pile. Ta da! Purple Daze by Sherry Shahan: I thought a novel in verse would be a good way to ease into the day and get a book finished early on (always good for motivation). Betsy and Joe by Maud Hart Lovelace: Still slowly making my way through Betsy-Tacy and loving every minute of it. Our Town by Thornton Wilder: Ben and I are going to read this together at some point during the day. It’s or favorite way to read plays. I don’t expect to read all of these. It’s just the pile from which I will choose my books. I’m doing Readathon Lite again. I have a race Sunday morning that I need to be up VERY early for so I will be quitting early. I also need to run out and pick up my race packet at some point on Saturday. But I will still be around for the fun most of the day. What are you looking forward to reading on Saturday? Next Article Ready to Readathon? You’ve got a great stack there for the readathon! I am not going to be participating, much to my dismay, but am hoping that the next time it comes around I can. The only two of those I’ve read are Our Town and Vampire Academy. 🙂 I want to read the Betsy-Tacy books sometime, though; it seems like everyone else has read them. Read SKIPPING A BEAT! Read SKIPPING A BEAT! I’m standing right behind Jen waving my hands and saying “I agree, I agree!”. I don’t have my pile ready for viewing yet. Realistically, I might finish one or two books. Dang girl, those are some big books in that pile! I have to stay with the small fries to make myself feel like I’ve put in the effort, LOL. Well, two of those volumes contain multiple books. So looks are deceiving. I figure the novel in verse and the play will go quickly. It’s Readathon time again? 🙂 I can’t wait to hear about your progress! !